This post is part of our series on gender and sexuality in Latin America and the Caribbean, in collaboration with NACLA (North American Congress on Latin America). This is the continuation of a conversation with Coral Herrera Gómez, published in two parts, the first of which can be read here. In the first part of our dialog about the work of artist, blogger, and scholar Coral Herrera, we discussed the opportunities presented by new technology for gender equality and the social struggle for the rights of women and LGBT persons. This time we will enter into a discussion about the struggle for gender equality in Latin America. We asked Coral to give us her impressions of the evolution of these struggles, both online and off, and we also talked about the road we have traveled and the one that remains before us. Global Voices: What have you discovered about the pro-gender equality movements thanks to new media? Coral Herrera: I am amazed by social networks because they have opened doors and windows for me to the entire world, they have broaden my horizons on all levels of my life: at the intellectual, personal, and professional levels. Before connecting to the world, I felt very alone with my books and my research, but now I sense that there are a lot of people who are also writing and sharing, with whom I can debate, build up, and deconstruct collectively. When I got connected to these networks, I entered into contact with a diverse group of women who fascinated me because they allowed me to meet other realities beyond what I had known in Spain. I'm amazed at the struggle of peasant women, Afro-descendant woman, indigenous women, migrant women, victims of trafficking, factory workers, domestic workers, disabled women, and being able to come into contact with them has allowed me to grow beyond the Euro-centric feminism in which I was living. Besides meeting with activists, it was fascinating to connect with feminist writers who were not only still living, but were also very active on social networks. Being able to follow them on a daily basis and to get to know them so “up close” allowed me to connect with feminist organizations and online publications from all over Latin America, and that was how I began to expand my networks and make contact with the groups of egalitarian men and LGBT activists, and with the queer groups that are slowly emerging. GV: What are the most pressing conversations that you're finding in the area of gender in Latin America? CH: Above all, I think it's necessary to continue to highlight the struggles of women for access to land and water, and the work being carried out in fighting against genetically modified crops and for obtaining food sovereignty. We also have to open up the debate within the feminisms in order to engage in self-criticism; it worries me that young people aren't identifying with feminist values and that our struggles are stereotyped in such a negative way. I believe it's a problem in communication: we feminists are the object of ridicule, jokes, insults, and pejorative comments; we are called ugly, witches, man-haters, sexually frustrated, etc. This is what's going on in Europe; in other parts of the world you can be murdered for being a feminist, as has happened in Mexico with human rights activists, for example. Within the feminisms, I think we have to create networks that are more horizontal and more inclusive. As in all social and political movements, within the feminisms there are still hierarchies, relationships of power, patriarchal power structures that we have to eliminate in order to be able to transform the world we live in. It's necessary to expand our sisterhood not only to those who are our equals, but also to humanity as a whole. [...] Diversity is an asset we have to take advantage of in order for, say, post-modern women to identify with the struggles of indigenous women, cissexual women with the demands of transexual women, women entrepreneurs with working-class women, Catholic women who struggle to depatriarchalize their religion with Islamic feminist women, etc. "Estamos más viv@s que nunca"
"Creo que es necesario seguir visibilizando las luchas de las mujeres por el acceso a la tierra y al agua, y el trabajo que se está llevando a cabo para luchar contra los cultivos transgénicos y por la obtención de la soberanía alimentaria. Además, hay que abrir el debate dentro de los feminismos para hacer autocrítica, a mí me preocupa que la gente joven no logre identificarse con los valores feministas y que nuestras luchas estén estereotipadas tan negativamente. 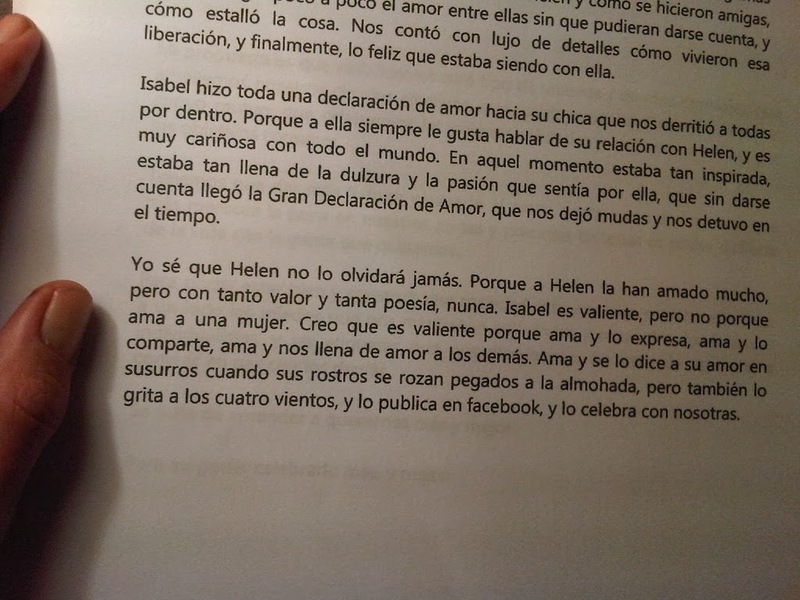 Creo que es un problema de comunicación: las feministas somos objeto de burlas, chistes, insultos, y comentarios peyorativos tales como que somos brujas, feas, odiadoras de hombres, frustradas, etc. Esto en Europa, en otras partes del mundo te asesinan por ser feminista, como ocurre en México por ejemplo con las activistas de derechos humanos. Dentro de los feminismos creo que tenemos que crear redes más horizontales de trabajo, y más inclusivas. Como en todos los movimientos sociales y políticos, dentro de los feminismos sigue habiendo jerarquías, relaciones de poder, estructuras patriarcales de poder que tenemos que eliminar para poder llegar a transformar el mundo en el que vivimos. 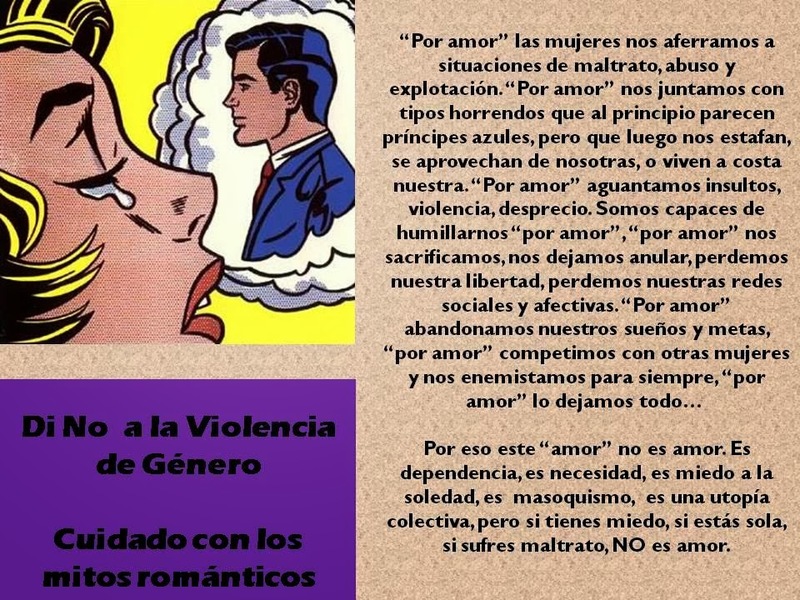 Es preciso expandir la sororidad no solo a las que son iguales a nosotras, sino con relación a la humanidad entera. [...] La diversidad es una riqueza que tenemos que aprovechar para lograr que las mujeres posmodernas puedan identificarse con las luchas de las mujeres indígenas, las mujeres cisexuales con las reivindicaciones de las mujeres transexuales, las mujeres empresarias con las obreras, las católicas que luchan por despatriarcalizar su religión con las feministas islámicas, etc. 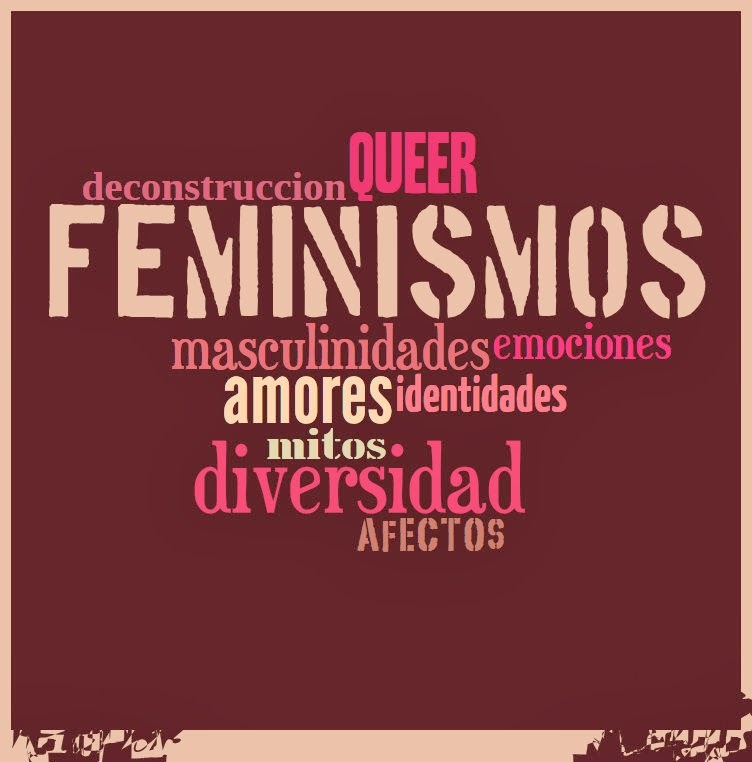 Creo que desde los feminismos no podemos luchar solo por la igualdad entre hombres y mujeres, sino que hay que abrirse a las luchas de las compañeras trans y lesbianas, las compañeras ecologistas o las islámicas, los compañeros igualitarios, o los grupos pacifistas, movimientos sociales, etc. Tenemos que abrazar la diversidad para incorporar las luchas contra cualquier jerarquía o etiqueta que nos oprima, porque en luchas parciales somos todos minorías. Es cierto que tenemos muchas divergencias ideológicas, pero sin duda todas queremos un mundo más equilibrado, más justo, más igualitario y pacífico. Creo que sin solidaridad es más lento y más difícil mejorar nuestras realidades, por eso me gustó tanto la campaña de “Somos el 99%”, porque nos crea un sentimiento de unidad frente a la casta privilegiada del mundo, que es un grupo muy pequeño de gente. 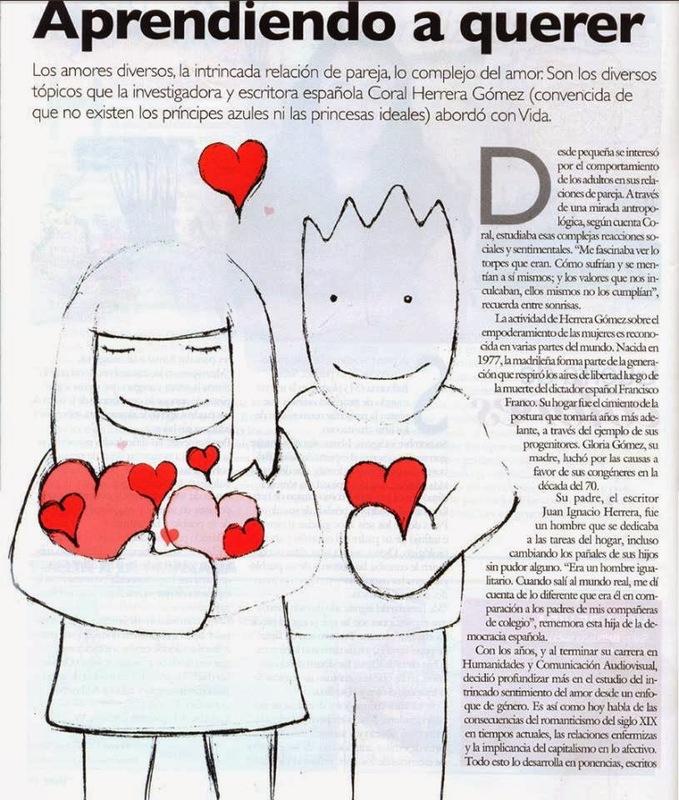 Entrevista en inglés: Global Voices: "We are more alive than ever"
Amore romantico vs uguaglianza di genere. Leggere Coral Herrera è respirare una boccata di aria fresca e di stimolante ottimismo nella lotta per il rispetto della diversità. Il suo blog, i suoi articoli, i suoi libri e le sue idee sono viaggi nel profondo di ciò che si crede ovvio e normale. 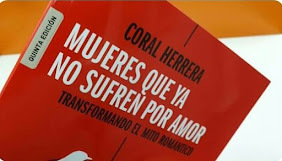 Coral si occupa principalmente di uguaglianza di genere e degli effetti che hanno prodotto gli immaginari romantici per il modo in cui gli uomini e le donne si rapportano e vedono se stessi. Attraverso l'amore romantico, instillando desideri esterni, il patriarcato ne approfitta per controllare i nostri corpi, per etero-dirigere il nostro erotismo, allo scopo di garantire che assumiamo i limiti che ha la femminilità e sogniamo l’arrivo del Salvatore (Gesù, il principe azzurro.) che ci scelga come buone mogli e ci offra il trono del matrimonio. Nella nostra cultura occidentale l’amore è obbligato perlomeno, nel discorso culturale egemonico. L'omofobia è culturale, la trans fobia è culturale, il razzismo e lo specismo sono culturali. In questa cultura si sviluppa la paura dell’altro, del diverso: si creano miti, mete, divieti, pregiudizi, e gli obblighi sociali. La cosa più logica sarebbe poter trasformare le storie, raccontarne di nuove, cambiare i modelli idealizzati oramai obsoleti, costruire eroi ed eroine in carne ed ossa, creare nuovi miti per aiutarci a costruire una società più giusta, egualitaria, ecologista, colta e pacifista. Indirizzare i nostri sforzi per il bene comune, lavorare per proporre altre realtà, lottare per costruirne di nuove, piuttosto che fuggire da ciò che c'è mediante paradisi e motivi e salvezze individuali. I suoi libri sono facilmente reperibili attraverso il suo blog, nel quale Coral condivide anche i suoi articoli di stampa e il suo canale You Tube, dove si possono vedere alcune sue conferenze e discussioni accademiche. 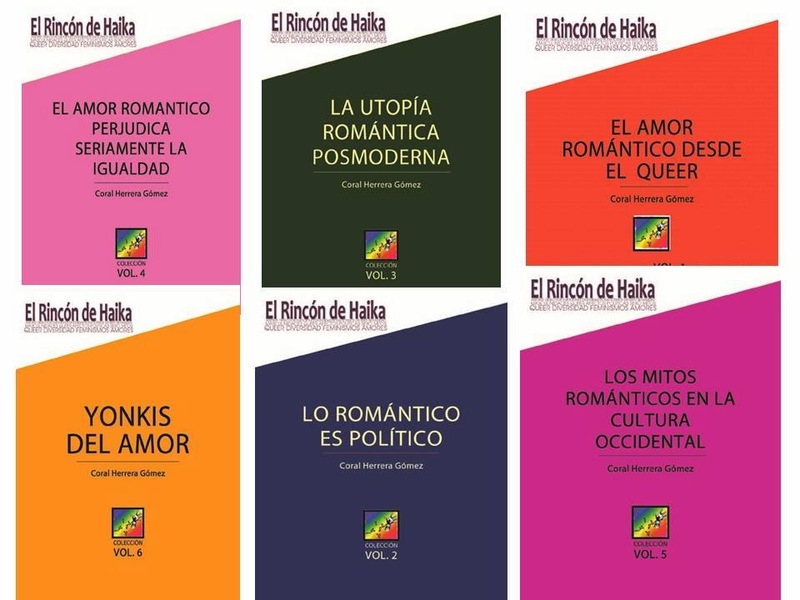 Il suo ultimo libro Bodas diversas y amores queer è “un libro a metà strada tra un saggio e un racconto in cui si mescolano riflessioni teoriche, aneddoti personali, storie di vita e qualche analisi di riti nuziali romantici alternativi. Per approfondire la riflessione sulla lotta per l'uguaglianza di genere su internet, presenteremo il lavoro di Coral Herrera in due parti . Chiudiamo questa edizione con la prima parte di una discussione online avuta con Coral nella quale parliamo sul ruolo dei nuovi, media nella lotta per l' uguaglianza di genere e le lotte che prendono forma grazie alle nuove tecnologie. Global Voices: Come possono, i nuovi media sfidare quelli vecchio circa la costruzione dei miti romantici? Come possono i nuovi media cadere nello stesso ruolo dei media tradizionali? Coral Herrera: I media tradizionali ancora si aggrappano ancora ai modelli tradizionali e a una visione del mondo totalmente patriarcale e capitalista, continuano a venderci ideologia egemonica in forma d’intrattenimento. Pubblicità e cultura di massa trasmettono valori totalmente egoisti, individualisti, basati sulla paura e la permanente insoddisfazione tipica, di quest’era consumistica. Per questo credo che una delle cose migliori che sono successe in questi ultimi anni sia Internet. Ciò che non è chiaro e se possiamo vivere di questo, perché ci siamo abituati in modo che tutto sia gratis. Io stessa non posso sostenere economicamente la gente che leggo, per la mia situazione precaria in Spagna prima e poi come migrante in Costa Rica , anche se pago la compagnia telefonica per avere accesso a tutti i contenuti. E anche se credo che non abbiamo ancora trovato un modo per guadagnare un reddito (anche se ci sono casi di persone che vivono di questo) , penso che la crisi che stiamo vivendo stiano rendendo più consapevoli di ciò che consumiamo , da dove proviene ciò che consumiamo , e in quali condizioni è stato prodotto. Il consumo di cultura è oggi (e sarà sempre) un atto politico , una dimostrazione di sostegno agli artisti e pensatori che ci offrono storie in tutti i formati e programmi possibili. Internet è stato vantaggioso per la cultura in generale , perché ora abbiamo accesso alle coreografie , sculture , film, reportage giornalistici,creazioni-video, canzoni, racconti, saggi, articoli accademici, cortometraggi, fotografie… I /le creativi/ve abbiamo più libertà nell’innovare e offrire altri modelli, altre eroine, altre situazioni, altri modi di relazionarsi. In definitiva, credo che stiamo rompendo con le vecchie strutture narrative che ci riducono a conflitti semplificati. GV: Che cosa significano le nuove tecnologie nella lotta per l’uguaglianza di genere? CH: Grazie a Internet tutti siamo emittenti. [ Questo ci fa ] meno vulnerabili alla costruzione della realtà che ci impongono dall’alto, perché siamo in grado di confutare le loro affermazioni , perché possiamo visualizzare tutto ciò che rimane nascosto per mantenere le cose così come stanno. E’ vero che dobbiamo renderci conto che la privacy è inesistente, che ci controllano, che commerciano con i nostri dati e ci censurano, ma penso che bisogni essere in rete comunque. GV: Quali vantaggi si hanno dall’uso delle nuove tecnologie per le discussioni sul genere (soprattutto in America Latina)? CH: “ Io sono molto ottimista. Nonostante il divario digitale che ci separa , penso che stiamo creando reti d’informazione e di riflessione collettiva transazionale. Queste reti ci permettono di appoggiarci l’una alle altre, visibilizzare le problematiche, raccogliere firme per incidere politicamente, chiamare alle azioni nel mondo reale che risuonino nel mondo virtuale. Possiamo unire le sinergie, scambiarci idee, copiare modelli che funzionano in altri paesi e adattarli alla nostra realtà locale, possiamo insegnarci a vicenda, possiamo contribuire alla costruzione di consapevolezza collettiva e possiamo modificare le agende politiche grazie all'eco delle azioni nelle reti sociali.”. Nella parte successiva di questo documento, che sarà pubblicato la prossima settimana, discuteremo con Coral dell’evoluzione della lotta per l’uguaglianza di genere e di altre questioni ancora da approfondire. Nel frattempo, consigliamo la visita al progetto editoriale Haika, promosso e gestito dall’autora e dal quale si possono scaricare molti dei suoi lavori. The NACLA Archive of Latin Americana is a historic documentation project that grew out of NACLA's research, publications, and activist network and is now administered by the New School for Social Research in New York City. Coral Herrera blows a blast of fresh air into the struggle for the respect for diversity. Her blog, her articles, her books, and her ideas examine pointedly the notions of the “obvious” and the “normal.” Coral is mainly interested in gender equality and the effect of romantic imaginaries on the way men and women relate to each other and see themselves. A contributor to publications such as Uruguay’sLa Red 21 and Chile’s El Ciudadano, Coral Herrera is also part of a new generation of fighters who start with gender equality but refuse to stay there. Her writings analyze structural problems in Western societies and the discomfort that arises in the intimate lives of men and women. Her work conducts a deconstructive critique of the causes and consequences of societal norms and the imaginaries that we defend without knowing why. Coral Herrera is a great enthusiast of new media, where she shares a large part of her work. 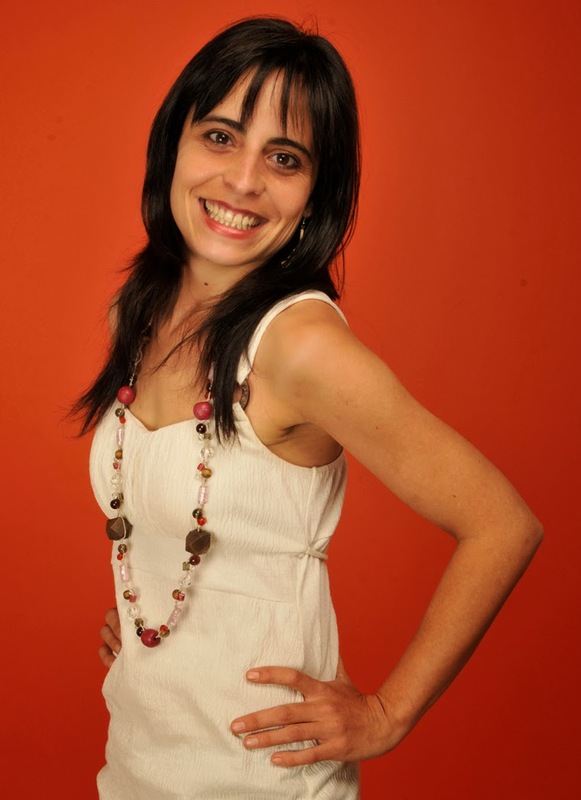 But in addition to blogging, Coral also pursues an academic path, with a PhD in Humanities and Audiovisual Communication. Born in Spain, she moved to Costa Rica a few years ago, and has worked as a teacher and consultant for UNESCO, the United Nations Latin American Institute for Crime Prevention and Treatment of Delinquents (ILANUD), and the Spanish International Development Agency (AECID), at the Paris-Sorbonne University and in Madrid’s Universidad Carlos III. 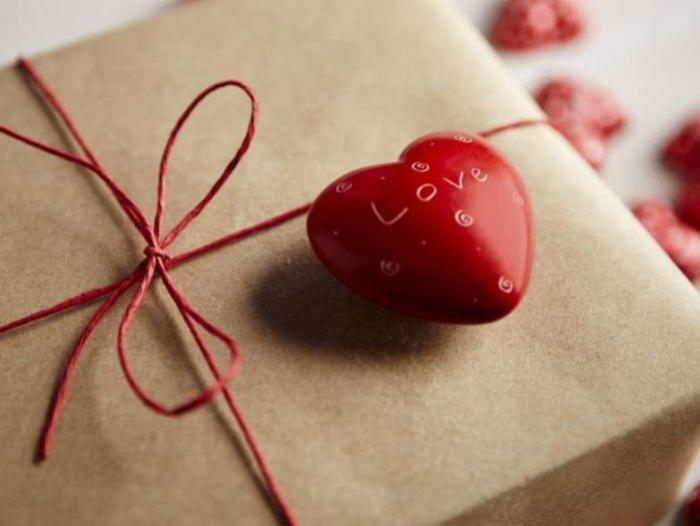 Through romantic love, inoculating foreign desires, patriarchy also controls our bodies in order to hetero-direct our eroticism, and make us assume the limits of femininity and dream about the arrival of The Saviour (Jesus, Prince Charming…) who will choose us as good wives and offer us the throne of marriage. In our Western culture, love is constrained, at least in the hegemonic cultural discourse. Homophobia is cultural, transphobia is cultural, racism and speciesism are cultural. Culture is where the fear of the other, of the different, grows; it is in culture where myths, goals, prohibitions, prejudices and social obligations are created. The logical thing should be to transform the stories and tell new ones, change the idealized models that have become obsolete, construct flesh-and-blood heroes and heroines, create new myths that help us construct societies that are more just, egalitarian, environmentalist, cultured, and pacifist. Direct our efforts towards the common good, work to propose other realities, fight to construct new ones, instead of fleeing from emotional paradises and individual promises of salvation. Why do people get married on such a massive scale? Why are there some people who only get married once, while others get married seven times?...Why does everyone ask about a baby but it’s frowned upon if the bride is pregnant? Why do we make romantic videos of our weddings and torture our relatives for months? Why do women invest so many resources in finding a partner?…Why can’t three people who love each other live together and get married? Why do we get excited when we are offered marriage? Why do we want this so much? Why do people endure conjugal hell for so many years? Why are there people who never get married? What are weddings like in other cultures? What comes after weddings? To offer a more thorough reflection on the struggle for gender equality on the internet, we will present Coral Herrera’s work in two parts. We will close this installment with the first part of an on-line discussion we had with Coral, in which we talked about the role of new media in the struggle for gender equality. Entrevistada: Coral Herrera Gómez. 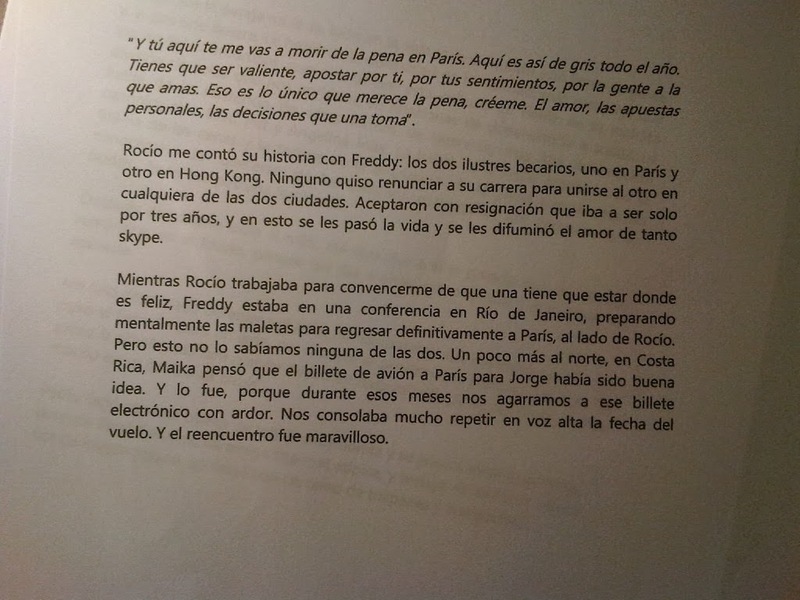 Autora queer y doctora en Comunicación Audiovisual. 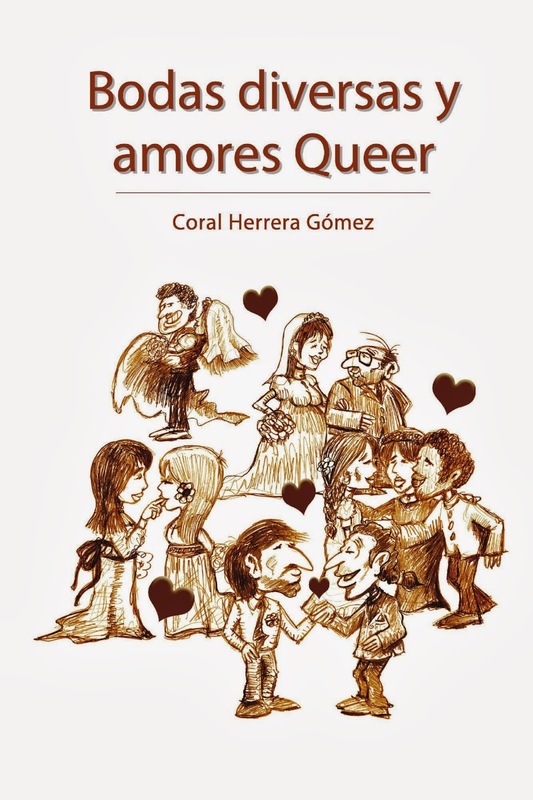 1- ¿De qué va tu nuevo libro, Bodas Diversas y Amores Queer? 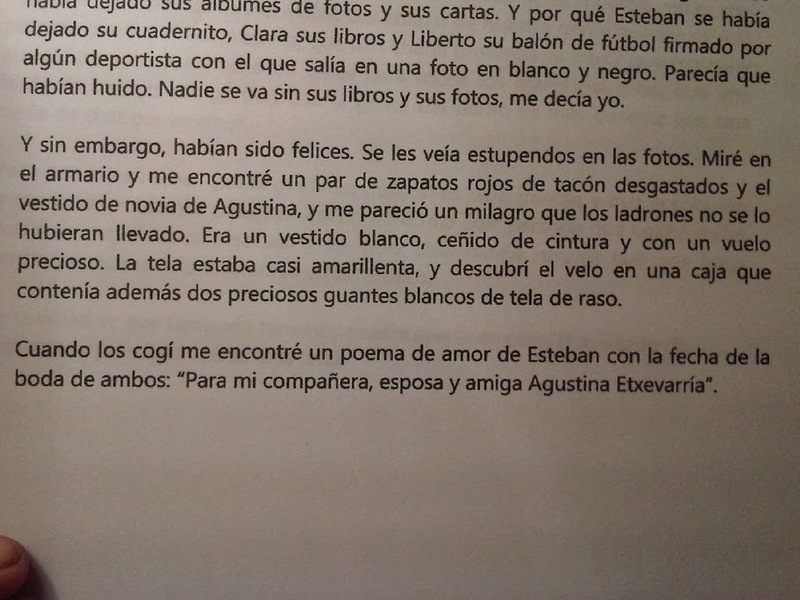 Háblanos de cómo se te ocurrió hacerlo. 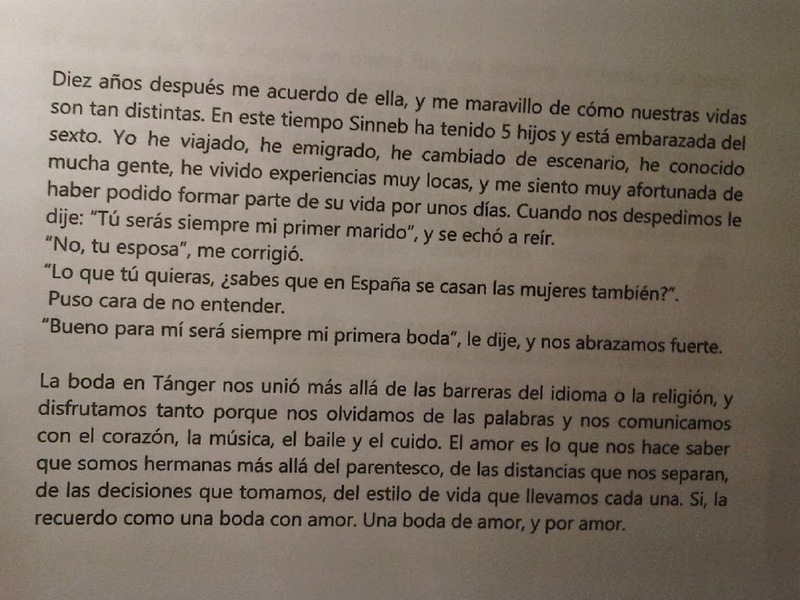 Es un libro a medio camino entre el ensayo y el relato en el que cuento mis bodas en Madrid, Tánger y San José, y otras bodas diversas. 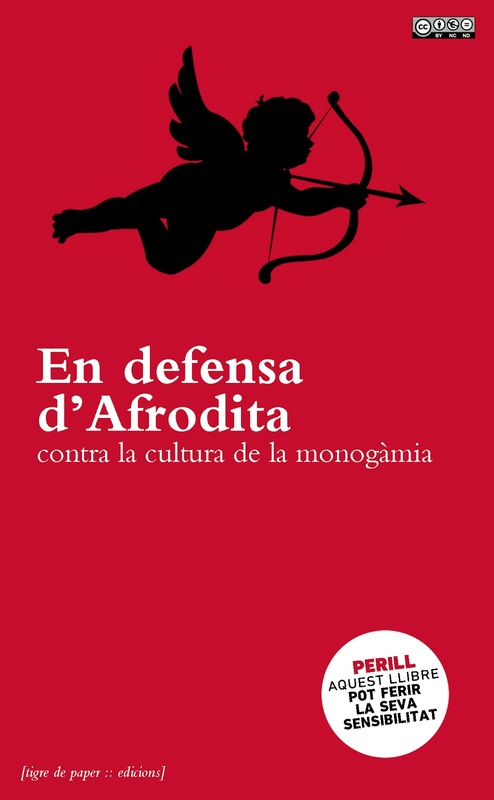 En primer lugar es una defensa del derecho a amar de todos los seres humanos, y un análisis de los ritos nupciales y las utopías románticas posmodernas. 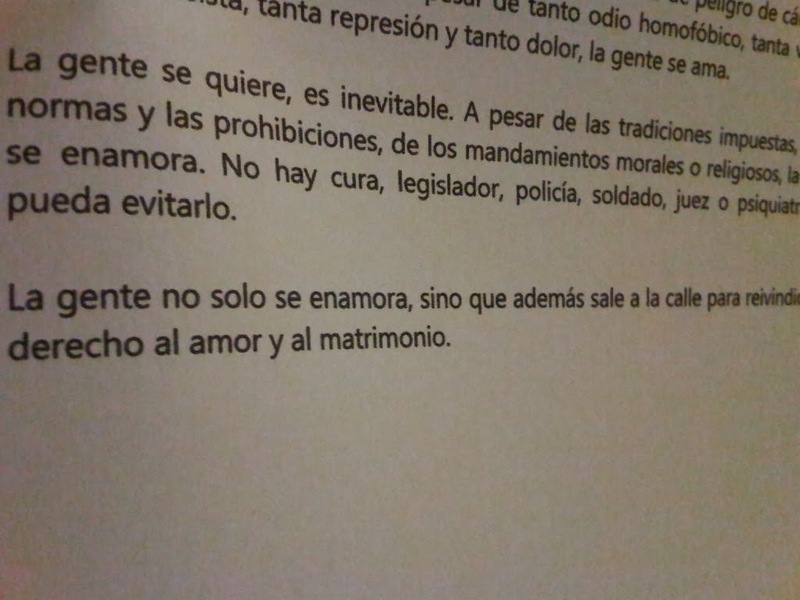 Los lectores y lectoras encontrarán pocas soluciones y muchas preguntas para desmitificar las bodas y reírnos un rato de nosotros mismos. 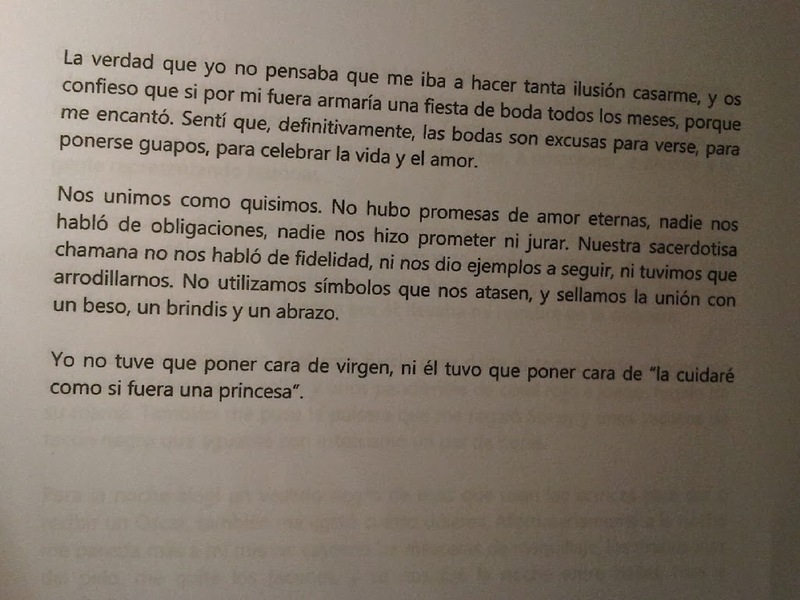 Es una mezcla de reflexiones, anécdotas personales, historias de vida, cuentos sobre bodas románticas y divertidas. 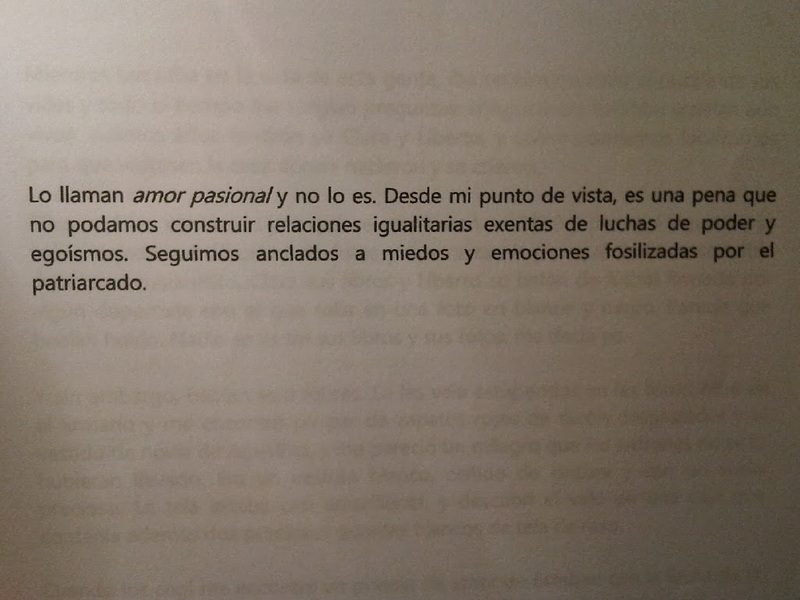 He querido hacer mi aporte a la visibilización de la diversidad de nuestra realidad amorosa, y contribuir a la creación de nuevos relatos sobre amores románticos desde una perspectiva más diversa. 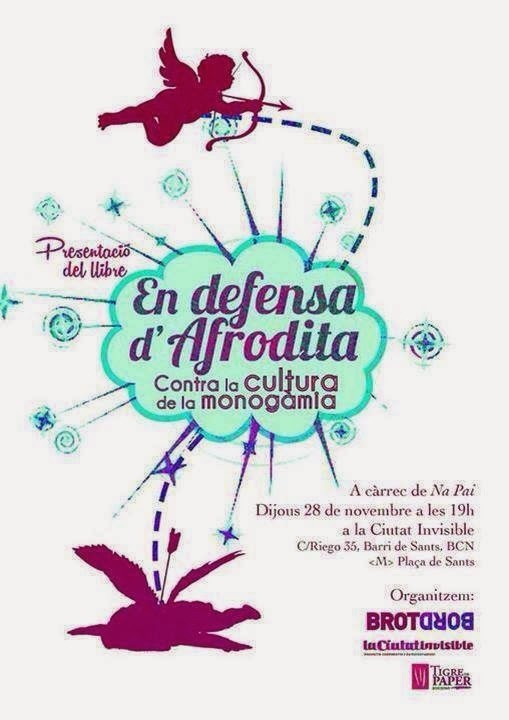 Además es una forma de reivindicar y homenajear la lucha por el matrimonio igualitario y los derechos humanos de la población LGBTQ. Es un proyecto personal porque esta vez no lo envié a ninguna editorial y quise sacarlo en una plataforma digital. Llevo muchos años ofreciendo contenidos en mi blog y pensé que era el momento de lanzarme yo sola en un proyecto empresarial auto gestionado. Ha sido un proceso duro, pero muy enriquecedor, porque he aprendido mucho sobre auto-edición y auto-publicación, marketing on line, diseño y maquetación…. 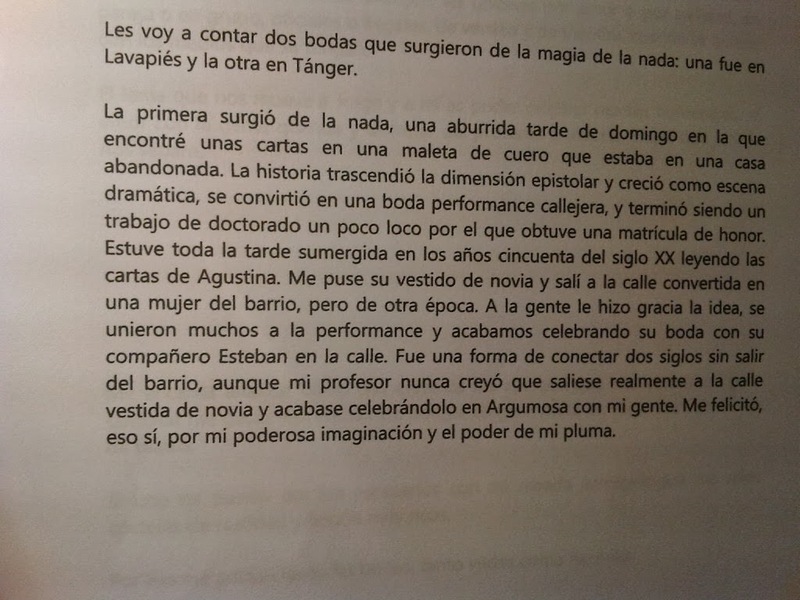 y he tenido un control total sobre mi obra. 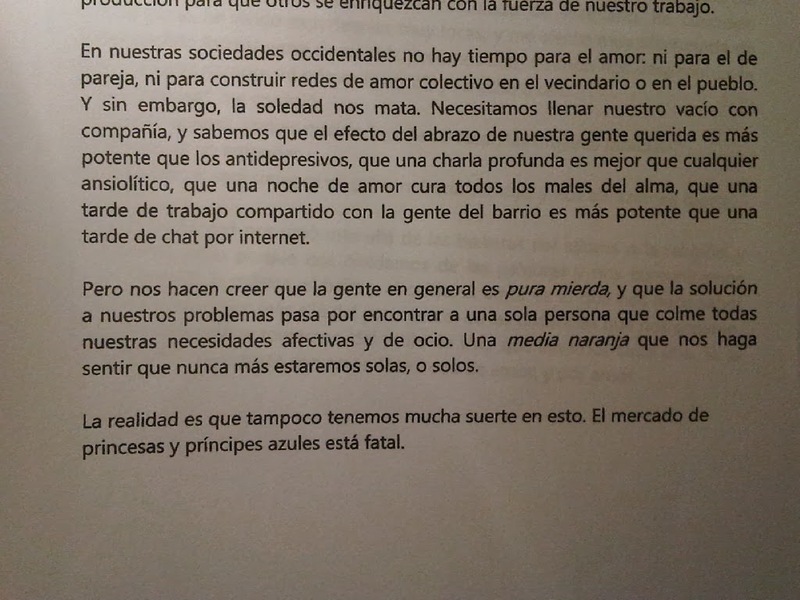 2- ¿Qué es el amor Queer? En Uruguay no es un concepto conocido, ¿puedes contarnos qué es el queer? Queer es un término anglosajón que significa raro y se utilizaba para insultar a la gente que no encaja en los cánones de la normalidad. La comunidad LGBT se apropió del término para reivindicar la existencia de todos aquellos que permanecen invisibles para la sociedad. La identidad gay o lésbica perdió en gran parte su carácter marginal y con la consolidación de las democracias actuales, pasó a ser la etiqueta que engloba a un sector de la población de clase media-alta, entorno urbano y cosmopolita que se integra sin problemas a la sociedad y tiene sus derechos plena o parcialmente garantizados. El queer surgió para dar voz a toda la gente que sufre no sólo discriminación por su orientación sexual, sino también discriminación por la clase socioeconómica, el color de su piel, la nacionalidad, la edad, el idioma, la religión. Así, el queer nació en las calles y llegó a las universidades: hoy es movimiento, teoría, acto político y artístico a la vez. 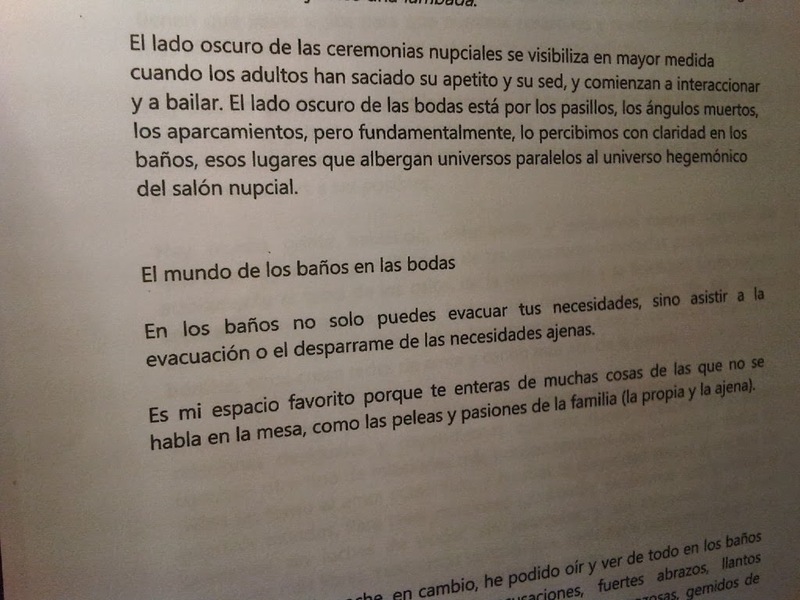 Es una herramienta de análisis multidisciplinar que nace de las teorías de género y del postestructuralismo y su afán es continuar con el derribo del pensamiento binario y la estructura patriarcal, visibilizar todo aquello que permanece en las periferias, y promover relaciones horizontales en las que las diferencias sirvan para enriquecernos, no para discriminarnos. 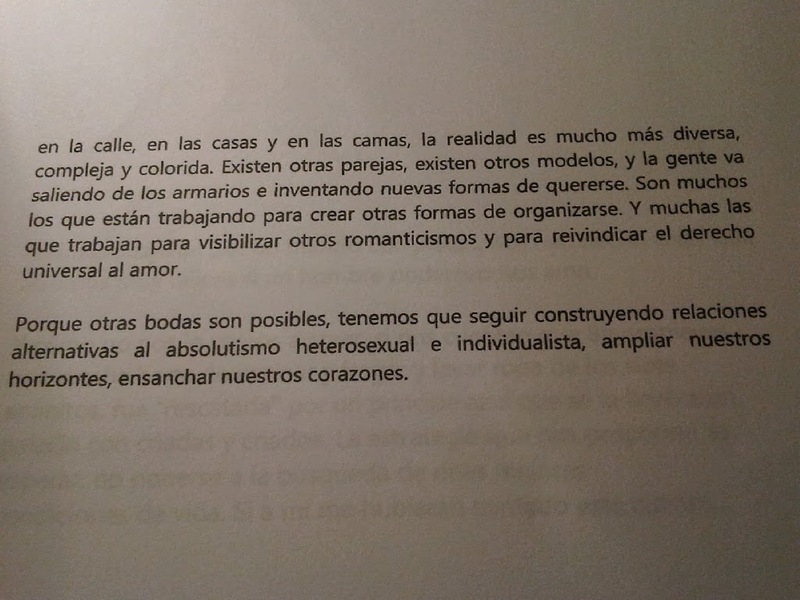 En mis libros hablo de los amores queer como sinónimo de amores diversos, esos amores que no corresponden al modelo ideal de pareja heterosexual y monogámica. 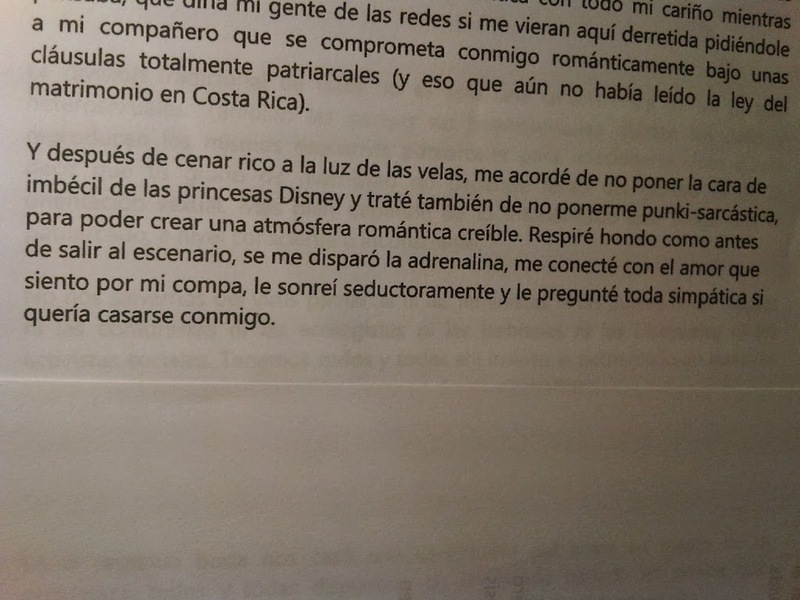 Más allá de la utopía romántica posmoderna, se multiplican las utopías amorosas alternativas de gente que se gusta y se quiere, se casa y se descasa. Son los amores interculturales, los amores intergeneracionales, los amores triádicos, los amores presidiarios, los amores adúlteros, los amores clandestinos. 3- ¿Por qué empezaste a interesarte en los temas de género. ¿A partir de qué experiencia? 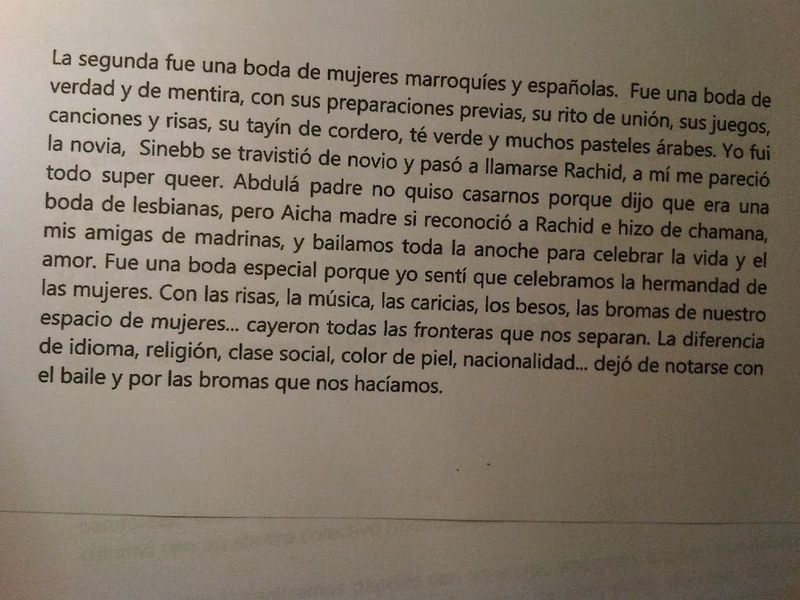 Mi madre era militante feminista y mi padre un hombre igualitario, así que ya desde pequeñita sentía mucha curiosidad por las diferencias entre mis padres y los de mis amigos y amigas del colegio. El jueves 31 de Octubre impartí una conferencia en el Taller de Género, Justicia y Diversidad que organizó el Programa Regional de Capacitación en Violencia de Género y Trauma de ILANUD, dirigido por la Doctora Gioconda Batres. 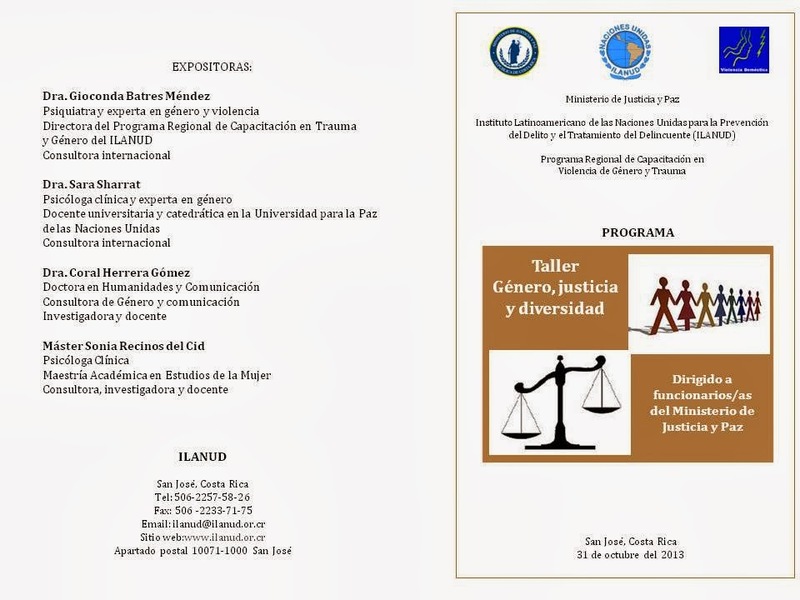 El taller estaba dirigido a los directivos del Ministerio de Justicia en Costa Rica. 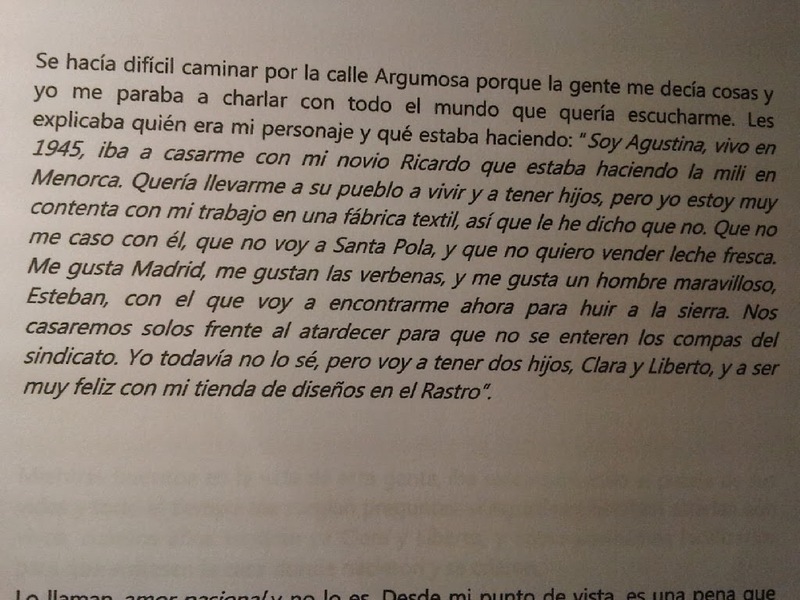 Estoy muy orgullosa de presentarles el primer Glosario Feminista en Lengua de Signos que ha coordinado Iztiar Abad publicado por Revista piKara, en castellano y en euskera. 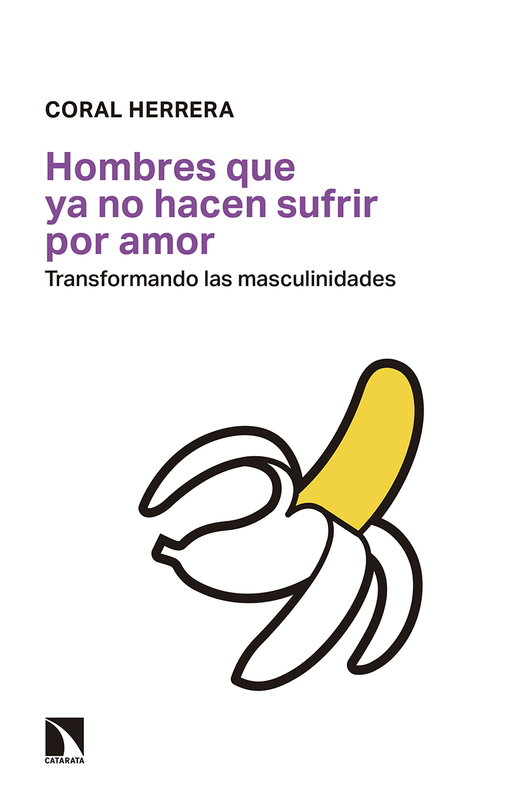 Yo participo en dos definiciones: Identidad de Género e Identidad Sexual. 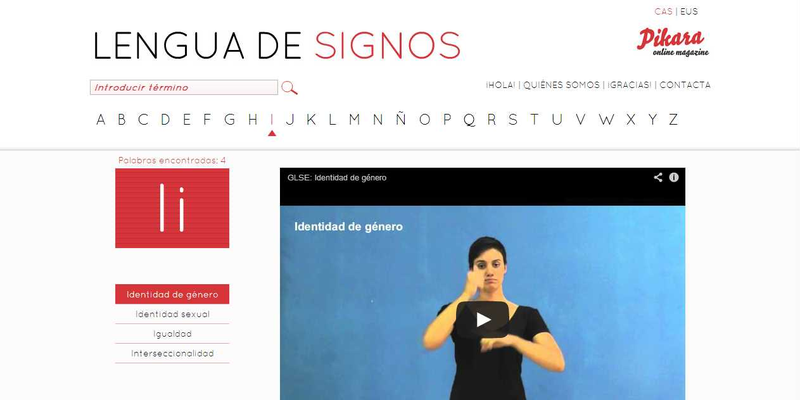 Muy contenta de poder haber aportado mi granito de arena a este proyecto para llegar a las personas con discapacidad auditiva y de estar entre las colaboradoras con Alicia Puleo , Asma Lanrabet, Beatriz Gimeno , Beatriz Ugarte Maiztegi, Chus González García, Clara Murguialday, Coral Herrera Gom , Edurne Bengoetxea Sorozabal, Elena Simón Rodríguez, Gracia Trujillo, Ianire Estébanez , Itu Medeak , Josetxu Riviere Aranda, Karmele I. Ruiz Antolín, Maitena Monroy Romero, Margarita López Carrillo, June Fernández, Mari Luz Esteban, Marina de la Hermosa, Matilde Fontecha Miranda, Mentxu Abril, Mikel Otxoterena Fernández, Miriam Ocio Sáenz de Buruaga, Norma Vázquez, Raquel (Lucas) Platero, Rocío Lledó, Teresa Maldonado Barahona, Teresa Torns, Zuriñe Mbaztan y Yaratullah Monturiol.